FIGURE 3: Crosstalk between MRX and Tel1. 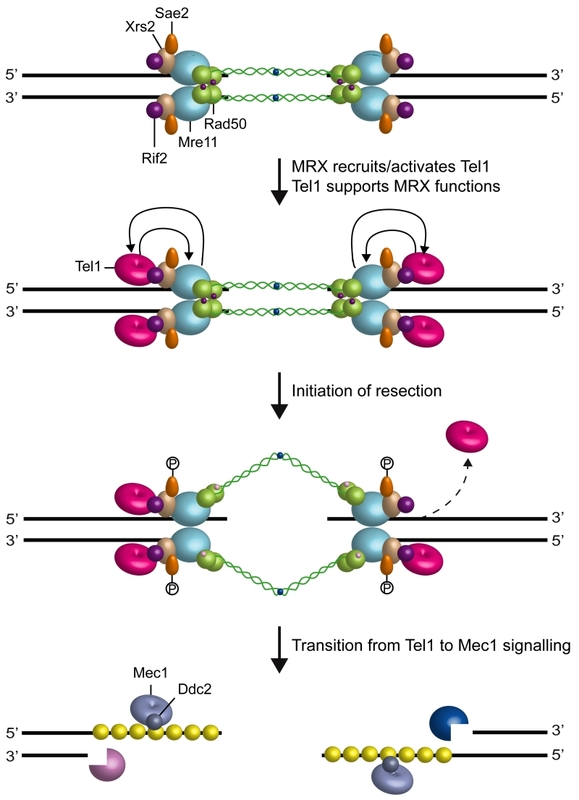 The MRX complex is required to recruit and activate Tel1, which initiates DSB signaling. Tel1, once loaded to the DSB ends by MRX, supports MRX function by promoting its association to the DSBs ends. Rif2 counteracts Tel1 recruitment to DSBs by competing with Tel1 for binding to MRX and stimulates Rad50 ATPase activity. Initiation of DSB resection by MRX-Sae2, Exo1 and Sgs1-Dna2 generate 3’-ended ssDNA tails that promotes a switch from a dsDNA-Tel1 to a ssDNA-Mec1 signaling activity.